Two hundred and ninety-three Naval recruits belonging to the 195th Intake of the Regular Naval Force (RNF) and the 197th Intake of the Volunteer Naval Force (VNF) passed out at a Passing Out Parade at SLNS Thaksila, Welisara Saturday. 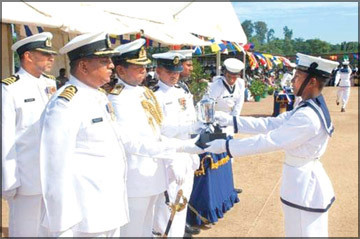 Sri Lanka Navy Director General (Logistics) Rear Admiral M Premathilake took the salute as Chief Guest. The 195th RNF Intake was trained at SLNS Parakumba in Sampoor and the 197th VNF Intake was trained at SLNS Vijaya in Kalpitiya. The newly passed-out sailors exhibited their skills and talents captivating the spectators. Sailors who excelled during training were presented awards. In the 195th Regular Intake, Recruit E M C L Ekanayake clinched the award for the Best Recruit. Recruit K S U Kumara was selected as the Best Sportsman. Recruit S T Ambepitiya won the award for the highest aggregate score in all subjects. Recruit A A S M Amarasinghe was adjudged the Best Marksman. The Sagara Division won the award for the Best Division. In the 197th Volunteer Intake, Recruit R M N B Rathnayake won the award for the Best Recruit. Recruit A T Lasantha clinched the award for the highest aggregate score in all subjects. Recruit P B W A E Samarakoon was selected as the Best Sportsman. The award for the Best Marksman was won by Recruit H P P Dissanayake. The Mahaweli Division won the award for the Best Division.